Naomi Osaka of Japan defeated Petra Kvitova from Czech Republic, 7/6(2); 5/7; 6/4 to win by an unrelenting aggressive play from start to finish.Osaka double faulted on first point of the match and faced break danger at 30-40 before surviving to lead 1-0. 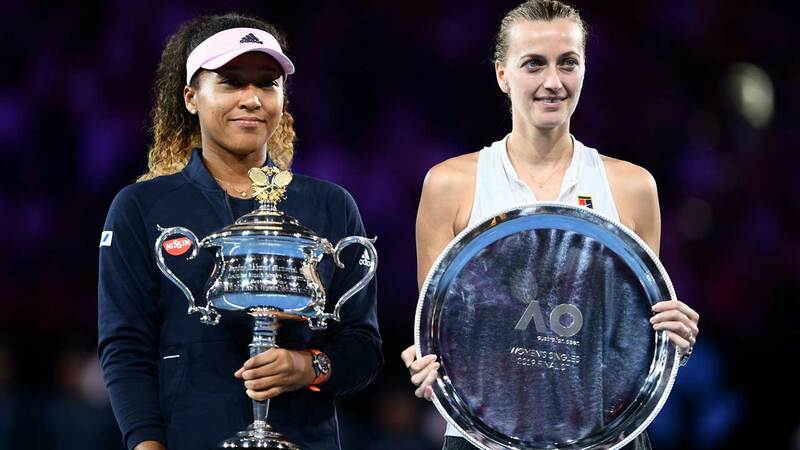 Kvitova, a two-time Wimbledon champion, held serve at love to level while Osaka hammered two aces in taking the third game. The first drama occurred in the fifth game as Osaka faced break threat before her offensive play elicited deuce and she had to fend off two further break points to hold. She also came from 30-40 to win the seventh game with a forehand winner. Serving in the 12th game, Kvitova opened with a double fault and saved two set points to hold. In the tie-break Osaka did not drop a service point but took two from Kvitova to win seven points to two and the set 7/6. Kvitova held serve in opening game of second set and broke Naomi’s serve to lead 2-0 lead. After leading Kvitova double faulted and dropped the game giving Osaka the opportunity to level on her serve. Kvitova lost her next service game at love while Osaka held serve and extended the lead to 4-2. Osaka also took the eighth game for 5-3. Serving to save the set, Kvitova faced three match points at 0-40 but battled deuce before two successive Osaka forehand errors gave her the ninth game. Serving for the match, Osaka lost three straight points and eventually conceded the break. In the 11th game, Kvitova was taken to deuce but held. Osaka was a shadow of herself as she lost three straight points and double-faulted to lose the 12th game and the set, 7/5. In the third set, Osaka broke her opponent’s serve in the third game to lead 2-1 and consolidated for 3-1. Kvitova saved three break points before holding the seventh game while Naomi took the eighth game without dropping a point The Czech star held serve to reduce the tally. Serving for the match, Osaka delivered an ace followed by a forehand winner and then forced a forehand error from her opponent to reach three match points. She lost the first on a forceful shot from Kvitova. On the next match point, her aggressive play yielded a missed shot from Petra and a new champion emerged after two hours and 27 minutes.